Matika Wilbur, Darkfeather, Bibiana and Eckos Ancheta from Tulalip, WA, 2013. Courtesy of the artist. 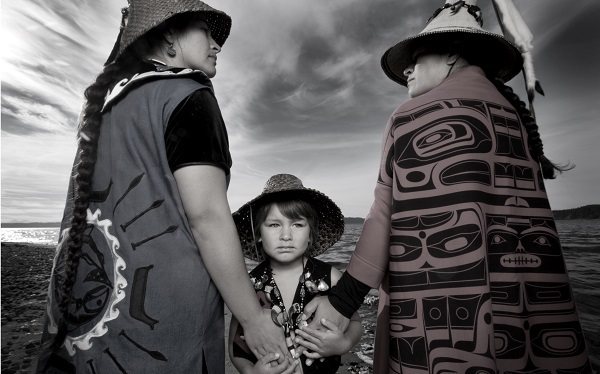 Washington photographer Matika Wilbur (Tulalip and Swinomish Tribes) is on a journey with Project 562 to build cultural bridges, abandon stereotypes, and renew and inspire our national legacy by documenting people from every federally recognized indigenous nation in the United States. Tacoma Art Museum was honored to present the inaugural exhibition of work from Project 562 in Photographic Presence and Contemporary Indians: Matika Wilbur’s Project 562. The exhibition featured 40 Native American portraits accompanied by stirring audio narratives from select sitters. Wilbur began her project in the Northwest and has traveled more than 80,000 miles around the Western United States to record the narratives and images for Project 562. She has been welcomed into rare experiences, capturing images and voices that have never before been represented. Wilbur’s provocative work exposes the tenacity and richness of contemporary Native life, and seeks to encourage a shift in consciousness toward Native Americans. What is revealed of Native America in these portraits? What consciousness unfolds from the many stories of the sitters?